RSS Feeds are the most popular web feed format on the internet. RSS (Rich Site Summary) Feeds are like newspaper headlines that keep you up to date on all of your favorite websites and areas of interests. When you surf a web page you may have noticed this icon somewhere on the web page. This icon is has the link to the RSS feed. Here is a example of what a web page looks like with a RSS Feed. 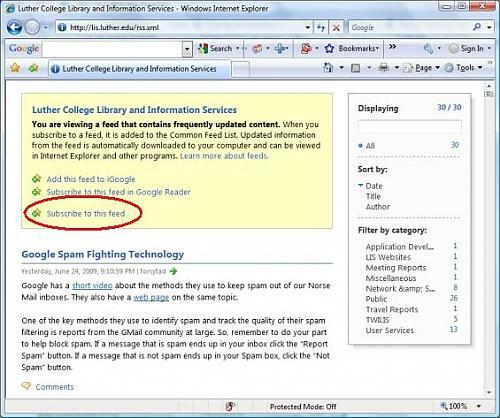 There are many applications that view RSS Feeds. Some of these applications are Norse Mail, Firefox, Thunderbird, Microsoft Windows Vista Sidebar. Adding RSS Feeds are simple. In this demo we will add to three different applications; choose one of them that you will use. We will use the following: Norse Mail, Firefox, and Microsoft Windows Vista Sidebar. 1. 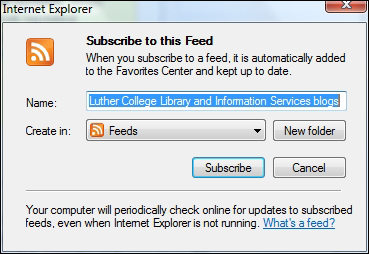 Open a web browser and go to mail.luther.edu and login. 2. Click on Settings then click on Web Clips. 3. Now open a new window or tab on your web browser and navigate to the web page that has the RSS Feed that you want. In this case we will use https://www.luther.edu/its/blog/. 6. Click Add and now your RSS Feed’s articles will show in your web clips. 1. Navigate to the web page that has the RSS Feed that you want. 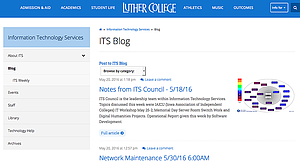 In this case we will use http://www.luther.edu/its/blog. 3. At the top of the web page, Live Bookmarks will ask you if you want to subscribe to this page. Click Subscribe Now . 4. When the Add Live Bookmark window pops up, click Add. The RSS Feed now shows up in your Bookmarks list. Below is your Microsoft Windows Vista Sidebar. You can use it to view your RSS Feeds. 2. Navigate to the web page that has the RSS Feed that you want. In this case we will use https://www.luther.edu/its/blog/. 4. Internet Explorer will ask you if you want to Subscribe to this RSS Feed. Click Subscribe to this feed. 6. After a few minutes the RSS Feed that you had just added will now appear on your Microsoft Windows Vista Sidebar.